I just love the holidays and celebrating with family and friends. I grew up celebrating pretty traditional American holidays mainly because I grew up in Florida. Sure, I attended the language classes on Saturday mornings as well as played various instruments which is stereotypical of my nationality. However, it wasn't until I moved to California and was exposed to all the different Asian communities was I even aware of certain celebrations. One of those fantastic celebrations is the upcoming Lunar New Year. For Asians all around the world, as well as Asian-Americans, the Lunar New Year is a celebration of the beginning of the year as well as the ending of Winter and the anticipation of Spring. It's an important holiday that is now a special part of my own family traditions. The Lunar New Year is based upon the phases of the moon and this year it falls on February 19, 2015. Best Buy is helping celebrate the event with an Asian-inspired Gift card and eGift card which is available for purchase or gifting from BestBuy.com through February 22, 2015. How beautiful is the iconic "red envelope" that I love receiving and giving. It's a beautiful design that is sure to be enjoyed by everyone. For an eGiftcard, scroll to the right of the following link under the "occassions" tab: https://bestbuy.cashstar.com/gift-card/buy/?ref=gc1. 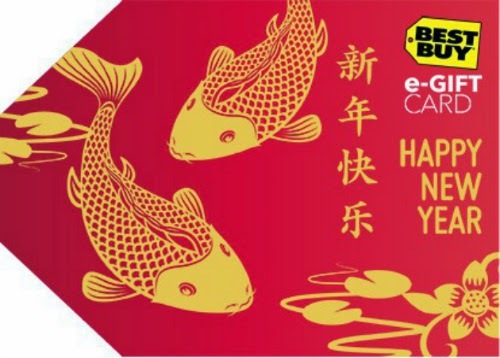 To order a hard copy of this gift card please visit: http://www.bestbuy.com/site/promo/lunar-new-year-gift-cards. Spread the love this Lunar New Year with this amazingly designed gift option from Best Buy. Do you celebrate Lunar New Year? Would someone you know be giddy over receiving a Best Buy Lunar New Year Gift Card? I love the look of the Lunar Year gift card, great colors. I would love to shop at best buy for a new tv..
What a fun gift card. I love the vibrant colors! We don't really celebrate lunar new year, but it's fun to know when it is. When I taught social studies, I always pointed it out when it came around on the calendar. I really like that design! It is beautiful! Thanks for sharing some insight into lunar year. I love that they made a gift card to celebrate Lunar New Year. I think since the US is such a melting pot of cultures, it's a great way to make others more aware of different holidays.Plus they're just really pretty cards! Such a great idea. I love the designs. I know some people who might enjoy their gift card in this style. This is one of the few Lunar New Year gift cards that I have seen. What a pretty card! Red and Gold symbolize good luck.